Have you been wondering what to eat with your evening tea or coffee? Although there are numerous options available, you should opt for some French toast, which can be eaten at any time in the day, but it tastes extra special with tea. Other than being extremely appetizing, French toast can be prepared within a few minutes, which makes it so special. Moreover, the recipe is quite easy, so you don’t have to be a cooking expert to prepare French toast. You can choose any form of bread while preparing this recipe, but wheat bread will taste a lot better. Before going to the ingredients, you should set the stove to medium heat and place the pan over it. Make sure that you have used the non stick spray on the pan, so that you don’t end up burning the bread, while preparing your recipe. Now, add some olive oil to the pan and spread it on the base properly. Allow the oil to heat up a bit, so that you don’t have to wait later. Take a medium sized bowl and crack all the eggs in it. Beat them properly before adding up the remaining ingredients. Mix milk, vanilla extract, powdered sugar and cinnamon to the bowl and beat them properly. Meanwhile, turn the stove to medium low, as the oil will be heated properly by this time. You can test that by dipping one drop of the mixture in the oil. 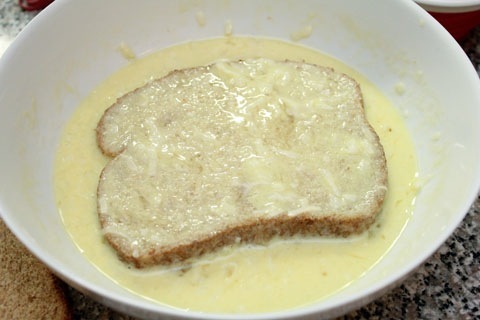 One by one, dip all the slices of bread into the egg mixture. Make sure both sides of the bread piece are fully coated as you will not get the desired taste. Start frying the bread slices into the pan until they are golden brown. Flip them over after one side is ready. Continue doing this until all of the French toast is ready. Place the bread slices on a paper towel to soak up all the extra oil.